Taken with Olympus E500 digital camera April 19th 2007. Click image for larger view. In this macro photo you can see a wolf spider (Lycosidae). 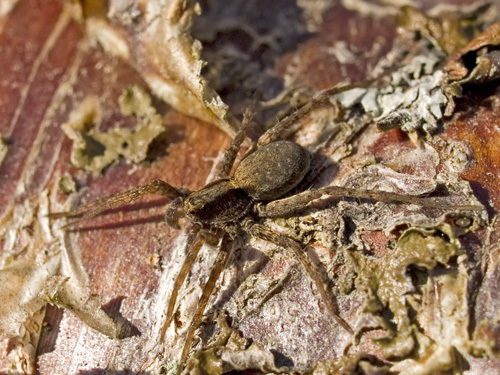 The wolf spiders got their name from the way they hunt as they run down their prey much like wolves do. It is usually very hard to get close to wolf spiders to get a picture, but this photo was taken back in April when there was still patches of snow here in northern Norway. This spider was warming itself in the sun and didn’t care about me coming very close with my camera. Please at the picture in large size to get a view of all the details of the wolf spider. I don’t have many pictures of spiders, but I have one of an ant dragging a spider. Check it out if you are interested in insect photography. Nice shot Thomas. These are actually quite small spiders – the macro really make it looks like a monster! This has fairly large palps, so is probably a male. We have these in Florida and they’re huge! They move rather quickly as well, which freaks out even the manliest of men (not me, of course). 🙂 Great close up shot, good thing it was cold out, otherwise you probably couldn’t have gotten so close. I try my best to stay away from these guys, so it’s always better to view other’s images of them. Great job!! i’m not a spider lover, but this is a great shot! Outstanding! I love macro photography, and this shot of the spider illustrates why. An amazing piece of micro photography! The details captured are really amazing.